The most popular news reporter in Ireland, if not the world, Teresa Mannion of RTÉ will make a necessary journey to Tourmakeady this Sunday, February 7. 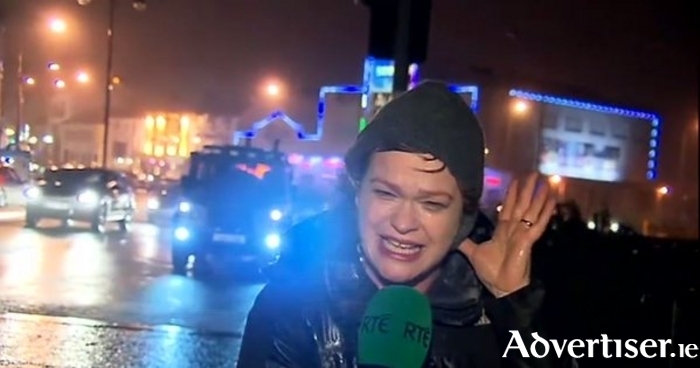 Teresa the RTÉ News reporter became an overnight celebratory following her dramatic report on storm Desmond from the Salthill promenade – a report that went viral over the internet. Yvonne Finn, who started the original Mini-Marathon in Tourmakeady in 2012, agrees with Mr Gibbons and added: “Getting together with other interested groups in Mayo to run the Great Lakes Challenge Series is an example of great community spirit, where five communities work together for the greater good of all our communities.” The money raised in each of the events will be going to a specific cause or, in some cases, towards the development of a local amenities or programmes. The first event is the 8km ‘Out of the Woods’ walk/run/job in Tourmakeady and will take place on Saturday February 20 at 12 noon. The route runs through the local Coillte woods in Tourmakeady and includes two hills, making it probably the most challenging of the five events. Organisers are looking forward to welcoming runners and walkers to the 8k. Money raised from the event will go towards the development of the local Páirc Sproai and CCTV system.